We go off the ‘highway’, and into the semi-desert environment that is so evocative of the Horn of Africa region. The shiny Japanese 4WD has no trouble navigating the rock-strewn and gravel-laden track and, after bouncing about for over half an hour, we reach a ‘checkpoint’ in the middle of absolutely nowhere. It’s made up of old blankets thrown on top of standing wooden logs to make a canopy, with a bored gunman seated on a plastic chair inside. He is the tourism department’s guy, and is basically in charge of an area several dozen square kilometres wide. He takes us to Laas Geel, a complex of caves with ancient rock art in an excellent state of preservation. The paintings cover an area of 10 rock caves, also known as ‘alcoves’. Stunning figurines depict wild animals such as giraffes, and decorated cattle, like cows and bullocks. It is believed the paintings, made in an erratic pattern, are the work of the herders who resided in these caves thousands of years ago. Though most of paintings are of bovines, many also depict anthropomorphs (figures in ancient art resembling human beings). The thorax is wide, and dressed with a type of ‘shirt’ showing vertically painted stripes. These characters sometimes carry a bow-and-arrow, sometimes just a stick. This indicates they were both hunters and herders. At the foot of the rocks of Laas Geel is a confluence of two ancient wadis, which are now dry riverbeds. 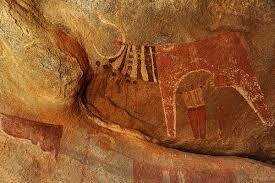 The paintings look like they were made a few hundred years ago, but are, in fact, between 5,000 and 7,000 years old. In the modern era, Somalia (and Somaliland) have been totally off the tourist map; as a result, there are few signs of any human damage in Laas Geel. The dry climate of the region has also assisted with the preservation. Although it was known to the inhabitants of the area for centuries, astonishingly, the cave complex only came to the attention of the world in 2002, after being ‘discovered’ during an archaeological survey by a team of French researchers. In fact, they were actually there to document the historical period when a production economy appeared in this part of the Horn of Africa. They were guided by villagers who knew about the caves from stories told by their ancestors. Back in Hargeisa, Professor Ahmad Dughleh Jameh, Head of the Archaeology Research Unit associated with the Ministry of Commerce, Industry and Tourism, said that carbon dating had shown the paintings go back to at least 3000 BC. “All we know about these caves is from the findings of the Frenchmen who undertook the excavation. The people who made these stunning paintings lived in these caves. Laas Geel - which loosely translates to ‘valley where you water your camels’ - was a permanent settlement. People who created this art were not nomads,” he told Gulf News. Only about 100 tourists visit the caves in a month. By adopting a sustainable approach and with modest investment – in good highway signage and better vehicular access – Laas Geel could become a tourist magnet, bringing in much-needed foreign currency for the Somaliland administration, and jobs for local people.